Parts of England have had their wettest January since records began more than 100 years ago, figures show. The Met Office said much of southern England and parts of the Midlands had already seen twice the average rainfall for January by midnight on Tuesday - with three days left in the month. And it is warning of more rain, as well as snow and high winds, for much of the UK in the coming days. 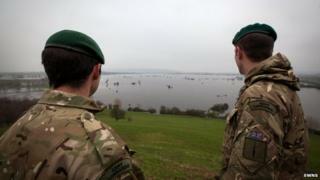 In Somerset, the military remains on standby to help flooded areas. A 15th meeting of Cobra, the government's emergency response committee, was chaired by Environment Secretary Owen Paterson on Thursday evening. Mr Paterson said heavy rain combined with high spring tides meant properties on the UK's south coast were at risk of flooding over the weekend, and he appealed to the public to pay attention to warnings issued. He said he was hopeful that a 20-year plan to deal with flooding in the Somerset Levels would be agreed sooner than in the six weeks he had specified. "As soon as we've got a plan, I'll be down there talking to local people," he said. Up to and including January 28, the South East and central southern England had a record 175.2mm (6.9in) of rainfall in January - beating the previous record of 158.2mm for the same parts of England set in 1988. Across south-west England and south Wales, the 222.6 mm (8.8in) of rainfall up to midnight on Tuesday meant January 2014 was already the fifth-wettest on record. Meanwhile, military planners have met council officials in Somerset over plans to bring relief to villages cut off by recent floods. It follows Mr Paterson's announcement on Wednesday that military amphibious vehicles could be deployed to help flood victims there. But Somerset County Council said the military remained on standby as the fire service was already providing vehicles and staff to deal with the situation. The military will remain on call for any future flooding needs over this weekend and the coming weeks. Pat Flaherty, deputy chief executive of Somerset County Council, told a press conference in Taunton: "With potential for high winds and high tides and more rain passing through and falling on an already soaked catchment we have potential for further flooding over the weekend and, with that, ongoing flooding for a number of weeks to come. "With that in mind we're still working very closely with the military who remain in Somerset, planning with us and we also have the resilience of knowing that their equipment and personnel are ready to be mobilised should we require them." Earlier, Labour's shadow environment secretary, Maria Eagle, accused Mr Paterson of "dithering". Scientists have a new phrase about the weather... global weirding. Before this record drenching, they mention the 2012 record warm winter in the US Mid-West followed by record cold this winter; record heat in Australia when normally ocean currents would have cooled the land; and the UK's 2012 drought cancelled out by floods. The jury's still out on whether humans are to blame for extreme weather. But consider this: we have drained bogs which used to catch rain; allowed soil to run off fields and clog rivers; built homes on our flood plains and supermarkets in our countryside; we've almost certainly heated the climate and swelled the sea level. Now up to 40 homes are flooded in Somerset, where high tides have hemmed in the rains. But that compares with 55,000 homes flooded across Britain in 2007. It could be worse. "Almost a week after Somerset County Council declared the flooding a major incident, the government has finally decided to respond," she said. Roads round villages including Muchelney have been cut for almost a month and about 11,500 hectares (28,420 acres) of the Levels are flooded by about 65 million cubic metres of water. Thursday has seen more settled weather, but the Environment Agency warned that high tides, strong winds and large waves would bring a risk of coastal flooding to communities in the south west of England on Saturday. It has more than 30 flood warnings in place and some 160 flood alerts - the majority in southern England - with fears that heavy rain falling on already-saturated ground could cause further flooding. The Scottish Environmental Protection Agency (SEPA) has also issued several flood warnings. The Met Office has issued an amber warning - meaning be prepared - for heavy rain in the Somerset Levels, and yellow warnings - which mean be aware - for rain across much of the south of England, Northern Ireland and Wales on Friday. It is also warning of high winds and rain for many western parts of the UK on Saturday and Sunday. In Wales, Aberystwyth University is set to evacuate student halls of residence on the seafront from 16:00 GMT on Friday in anticipation of stormy weather and high tides. It told students to stay away "until you hear differently, which could be Monday". BBC Weather presenter Nick Miller said the long-range forecast suggested there was "no prolonged dry spell in sight". For the UK as a whole, 164.6 mm (6.5in) of rain has fallen so far this month - 35% above the long-term average. Dredging, flood barriers, natural flood management and sustainable drainage are recognised methods of preventing or alleviating flooding. BBC News looks at how these methods work and the scientific principles behind them. The figures will come as no surprise to those in the country who are continuing to suffer the aftermath of severe winter floods. But the Met Office said it had seen a contrast from south to north across the UK, with northern Scotland having received 85% of its long-term average rainfall so far this month, compared with 200% over southern England. Wet weather in winter usually means temperatures have been mild, and the UK mean temperature up to 28 January was 4.9C (41F) - 1.2C above average. Met Office analysts said the whole of the UK was on target for a wetter-than-average winter. The South East and central southern England are already seeing their sixth-wettest winter since records began in 1910 and the wettest since 1995 (369.7mm of rain). The wettest winter on record was 1915, with 437.1mm of rain. The main reason for the mild and wet weather so far was a predominance of west and south-west winds, bringing in mild air from the Atlantic, the Met Office said. The BBC News Channel is providing live coverage from some of the worst-affected areas throughout the day. UK weather: Why has it been so wet? Would river dredging solve floods?